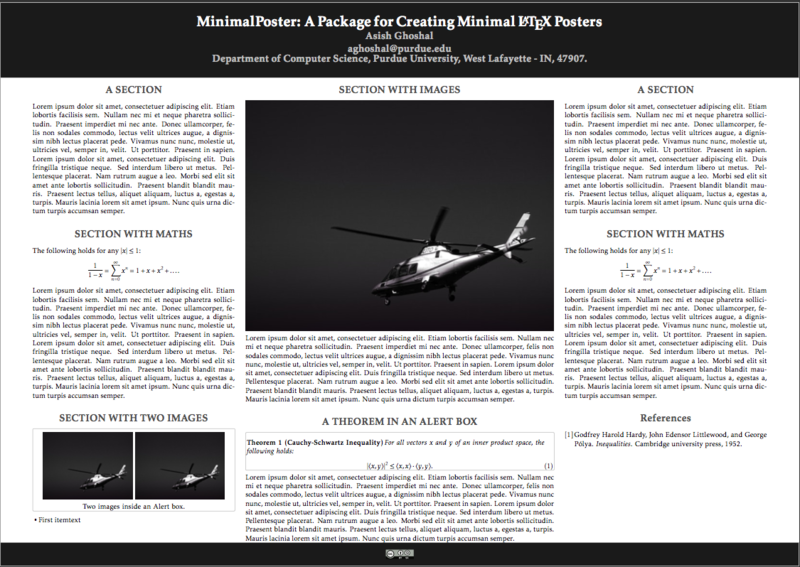 MinimalPoster is a Latex package for creating, as the name suggests, minimal posters in Latex. 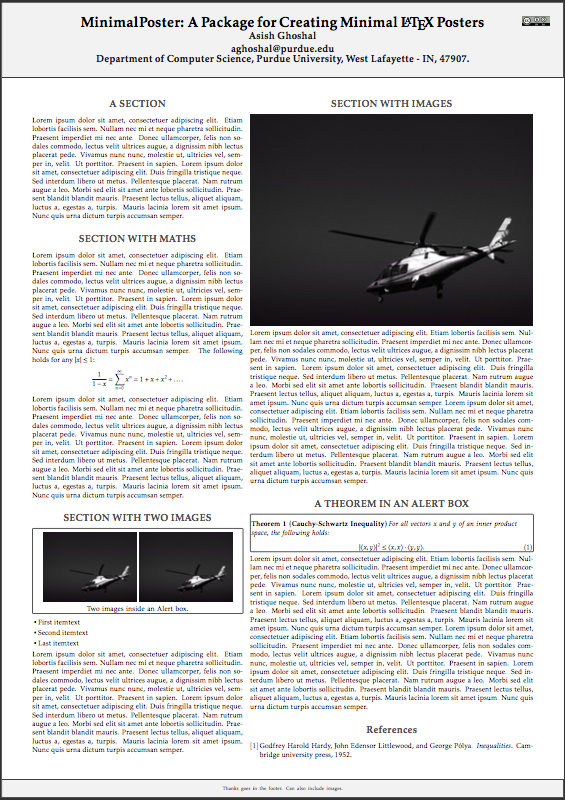 The primary motivation in creating the package was to make it extremely easy for Latex users to create modern looking posters in Latex with minimal visual noise and unnecessary flourish. Content is organized into columns and the only design choices involved in designing posters using MinimalPoster are: the orientation of the poster, i.e., potrait or landscape, and the number of columns and the relative width of columns. Content in columns are standard Latex constructs. The package is a thin wrapper around the a0poster Latex class and textpos package. The following are two example posters created with the package. Let's say you want to create a three column poster in landscape mode with the column widths being in the ratio 2:3:2. This can be accomplished by the creating 7 (2+3+2) logical columns and then creating three actual columns with widths 2, 3 and 2 respectively. where the width of each column, in terms of number of logical columns, is specified in square braces. Content inside each \BeginColumn and \EndColumn block can be organized into standard Latex sections. For more complete examples checkout the examples provided with the package. The package provides the following pre-defined color themes: tranquil, zen, fury, greed, calm, dirty and fear. Additional color themes can be created easily. Needless to say a working latex installation is needed for using the package. The package also requires the following Latex packages: textpos, xcolor, tikz, kpfonts, kvoptions, calc, and sectsty. The package itself is distributed under a Creative Commons Attribution-ShareAlike 4.0 International License. The license does not apply to the posters created with the package.